A blackbird flew again from roost to distant land. Were seen in dream on ocean's bend. Through autumn set an eastward course o'er loam and root. The heavens opened to dawn contend. Until the errant souls in peace amend. Footfall trod to hearths uncold in the inn beneath the shade. For a table set in the house of honey-wine. When given nothing, all things we must create. And from nothing, I made more than I imagined I would ever be able to give life. 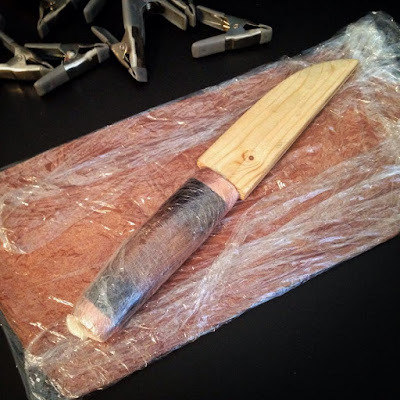 From nothing but scraps and trash, I embarked on a journey to make a puukko, a traditional Finnish knife, for an exchange known in the community as a Knife in the Hat. The last one I entered pushed me to my limits as far as patience in design and execution, and at the time yielded my best work to date. Here, I had a similar experience, and while the result is not as visually striking, the constraints of material and workspace brought me to understand the use of hand tools on a level which I have never before known. To start, I grabbed a handful of scraps from the rubbish bin, cutoffs from other blades, failed projects, even bits of scrap pattern weld. The above result, tack welded into a hideous mass so I could hold onto it in the forge, is less than promising. 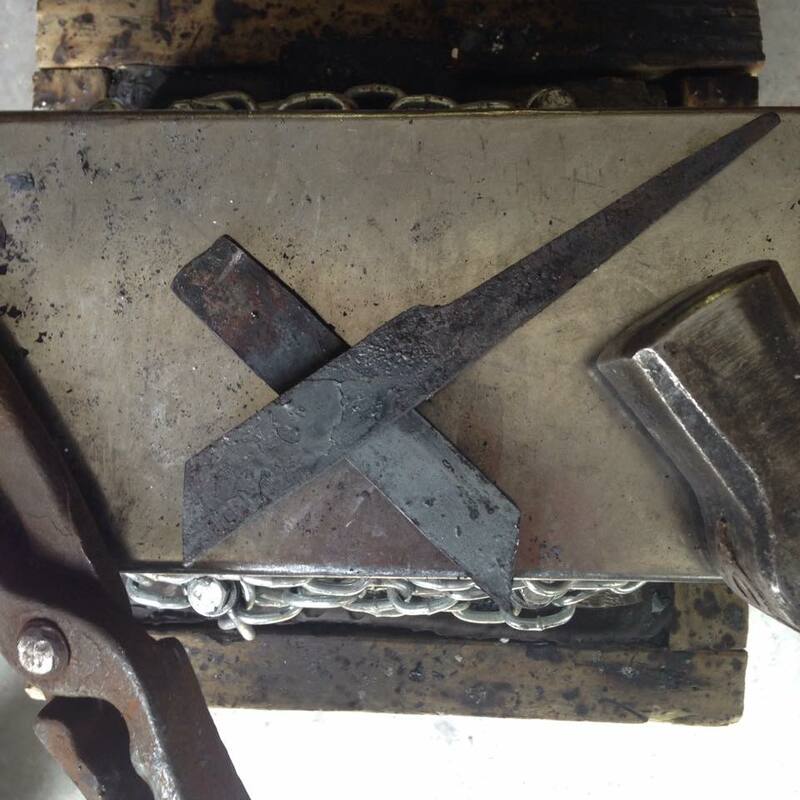 After the first pass in the forge, the billet is solidly welded together. On one face, I laid two strips of old delaminated pattern welded steel side by side, and here that seam is all but invisible. 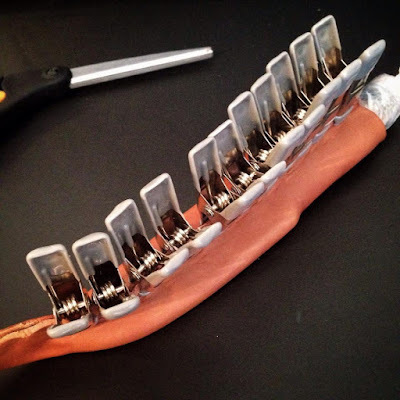 At either end, the uneven pieces resulted in poor welds and quite a bit of scale. Instead of trying to salvage it, I cut them off and returned them back to the scrap bin. Two folds in, and the billet is extremely solid and clean of weld flaws. Above, only a faint line can be seen at the tong-end, which too disappeared in the subsequent working. 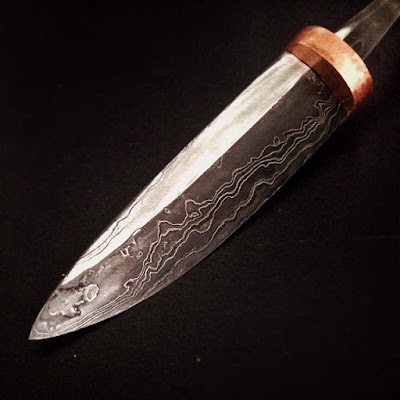 Although I do not recall how many layers and folds I went through to establish the steel's pattern, the final billet is somewhere around 100 layers by the time I began forging the blade to shape. Also, because the steel all came from scraps, it was unmarked in alloy, making a predictable pattern difficult to create. 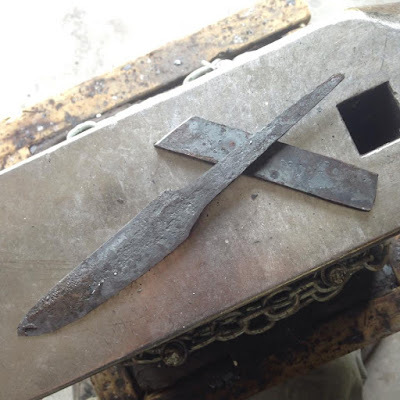 Due to the unpredictable nature of the steel, I began with twice as much as I needed in the event that the one blade failed during heat treatment. 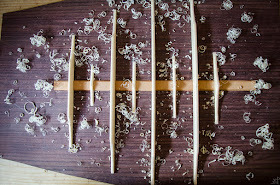 Here, the first (and only) blade has been cut from the bar and the tang established. 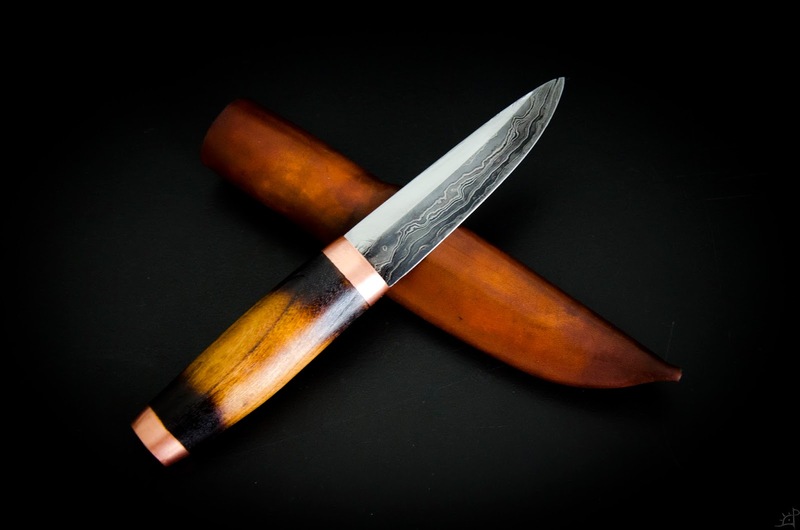 Puukkos, unlike most modern knives, have a skewed pentagonal cross section where the widest part of the blade is midway between the spine and the edge. Narrowing as a false edge might, the spine grows thinner, but still maintains a fair amount of thickness that is not sharpened. With the blade forged to shape, I began removing the scale. This is the first major project I was able to use my new belt sander, and what a difference it made! Opposed to my old 2x42, moving to the 2x72 was about as significant as the transition between draw filing and the 2x42. A stronger, faster motor and the ability to adjust various surfaces to grind on made for short work of the scale. This profile is, like most things I do, not something I have done before. The centreline is relatively fragile in that it is easy to destroy by the slightest misstep at the grinder. As a result, once the rough profiling was finished, I turned to EDM stones, a synthetic abrasive similar to whetstones but very different in intended application. At this point, the blade has just come out of a quick temper lest I drop it and it shatters (no pictures of the heat treatment process) after the final bit of girth on the edge bevel was taken out. This was also the first glimmer of the pattern, which is about what I expected. Removing scratch marks from the grinder is laborious to say the least. 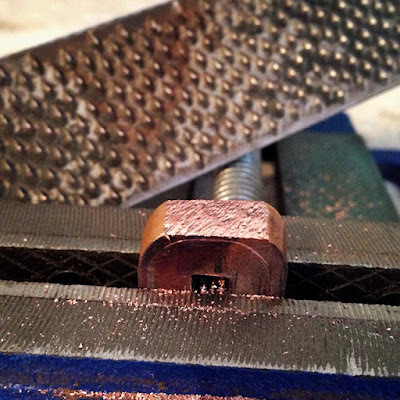 Even the slightest of lines will darken dramatically when the blade is etched, so it is imperative that they are all removed from one grit before moving to the next. For now, this will suffice. 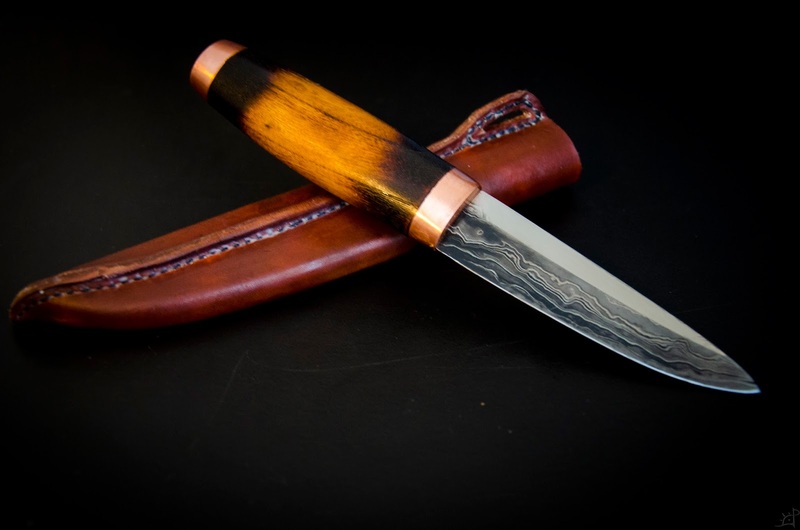 I do not intend to polish the blade yet because of how often it will be handled in the making of the handle and fittings. The blade is finished (for now), so I can turn my attention to the handle. For wood, I used part of a block given to me by a friend who builds and restores clocks. He did not know quite what it was, but I believe it came out of his firewood pile and had no other use for it. To start the holes, I drilled twice through the block, side by side, and filed it open until the tang began to fit inside. For the rest of the way, I heated the tang and burned it in. Because I do not have a drill press or other means of ensuring the hole is straight, I leave handles a bit oversized until it fits onto the blade. Alignment traced and the shape sketched in, I can now begin the bulk removal process with an old hand plane. 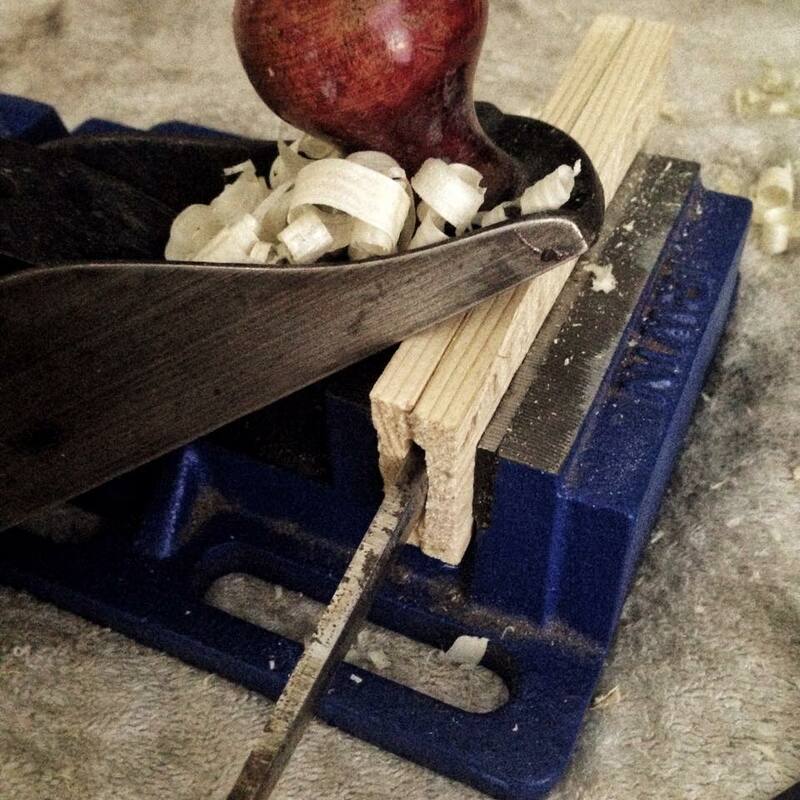 From here out, everything is done with hand tools. Just after the handle was burned on, I had to move into an apartment where shop amenities failed to match my old garage. So, with determination and my computer desk, I did the rest the only other way I could. Keeping with the trend of sub par phone quality pictures, it was time to work on the fittings. 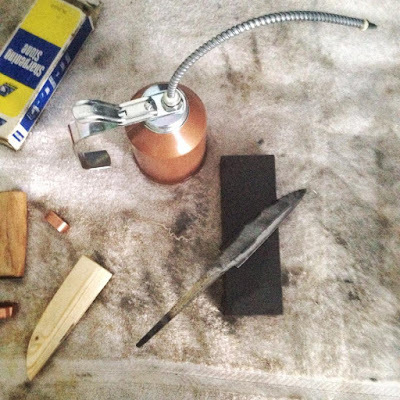 I cut a piece of copper out of a bar that was once (I think) an electrical distribution bus. About a half inch thick, this part took far longer than I care to admit. 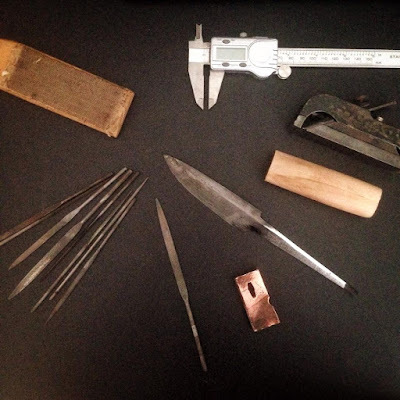 Needle files are all I had to open the hole for the tang, and filing that much copper, despite its relative softness, took quite some time. Finally, it fits snug to the shoulders. 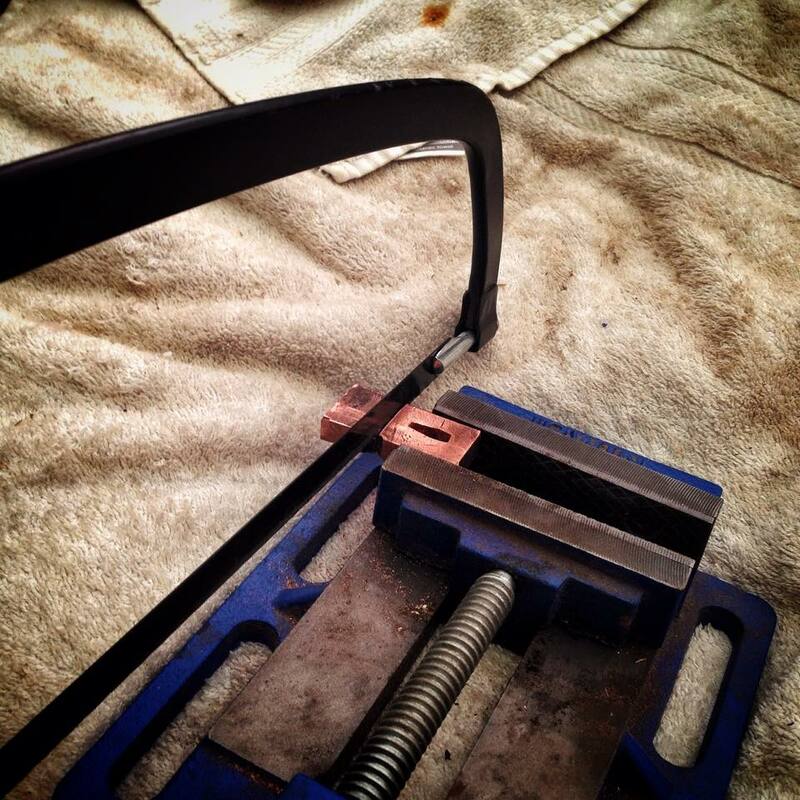 Removing the last gaps between copper and blade was a long road of trial and error, but there are no shortcuts here. Since this, I obtained a file guide, which would have been immensely useful in squaring the shoulders of the blade before fitting it to the copper. Even the slightest misalignment between the spine and edge sides, or curving to the lines, results in unsightly gaps. Making the second cut in the copper. For the last four months or so all I have had as a workbench is a towel on my floor to collect dust and filings. Same as the first hole, I have to drill it too by hand. Shortly before moving, the motor on my electric drill shorted, so once more, it's to hand tools that I have to turn. 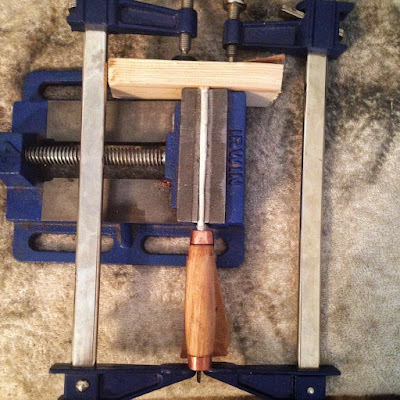 With the back end of the handle wood scribed on the copper, I can begin working it down to size. 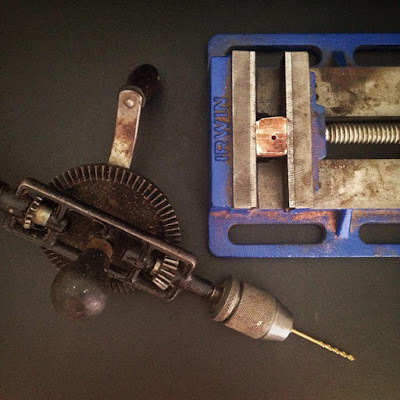 Instead of breaking my fingers with the hack saw again, I used a farrier's rasp, which did wonders to remove material quickly and relatively cleanly. 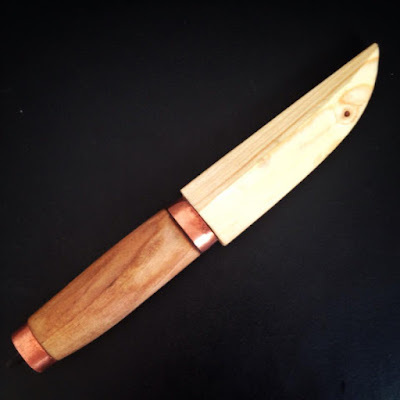 After several days working away at the copper, I finally decided to move on to the sheath. 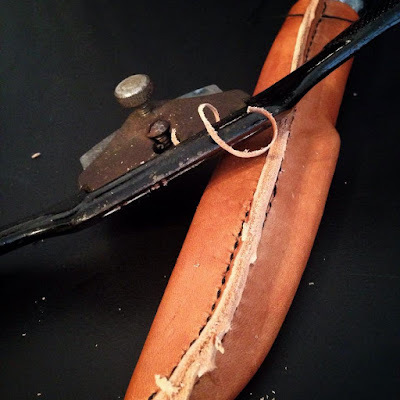 Traditionally, puukkos had a wooden core and high necked leather sheath, a combination I had- you guessed it- never tried before. 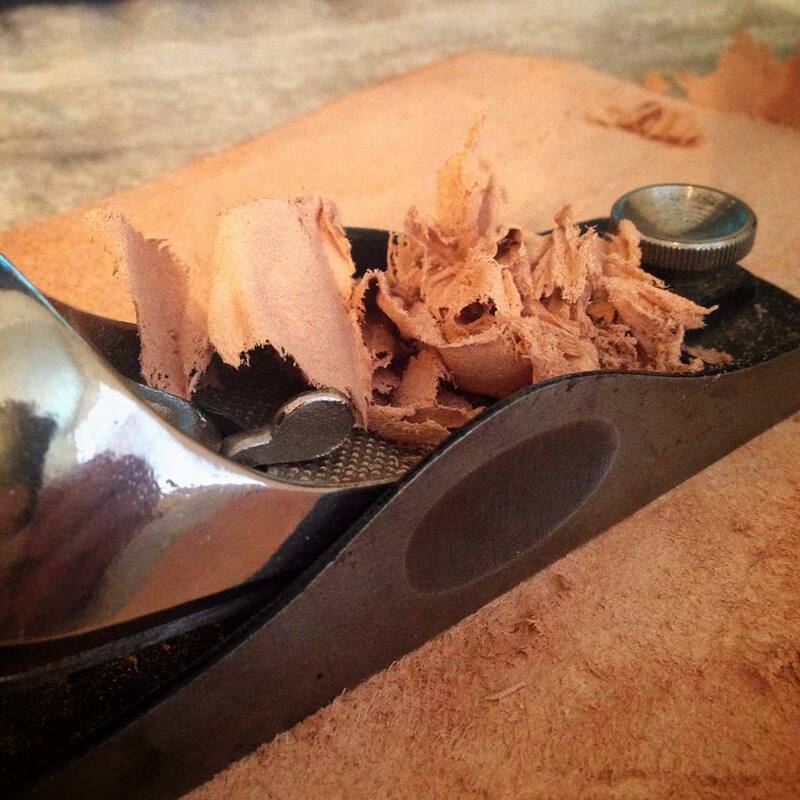 With a random piece of wood from the laundry closet, I cut, split, and carved two halves for the blade to sit in. Once more with the trusty plane I worked it roughly to shape before gluing the two halves back together. 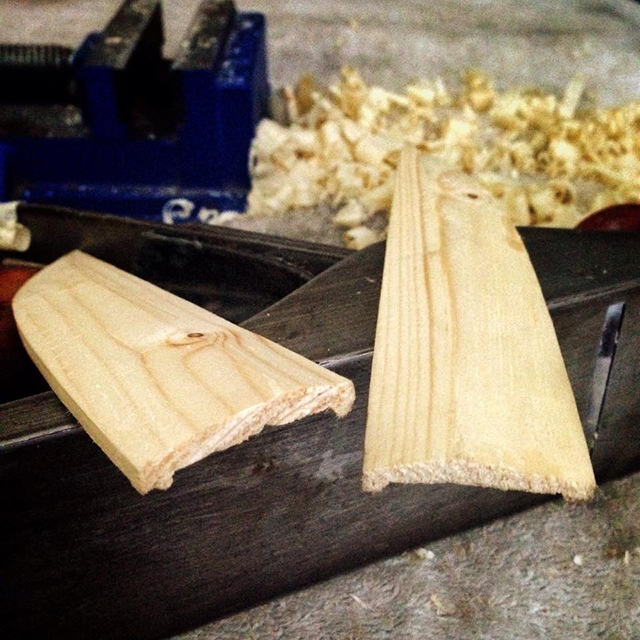 I am always surprised by how thin I can take the wood before while it still looks overly robust and unwieldy. 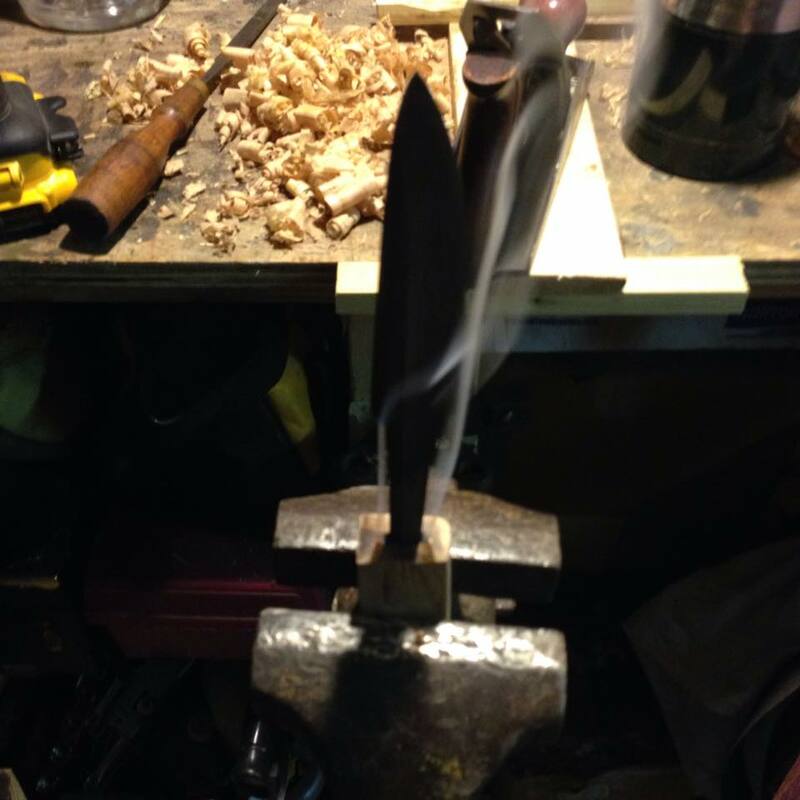 Now that the two halves are glued back together, a fit that is tight enough already to hold the weight of the knife through its friction alone, I can return to the blade and finish the final details before assembling the handle and finishing the sheath. Unlike whetstones, the EDM stones are not very large and wear rather quickly, so I abandoned them for the final finish. An old oil stone from a garage sale years ago some friends gave me suited the task perfectly. Unmarked 'rough' and 'fine' grits were enough to bring the edge to a shaving sharpness, albeit a painful shave. A few low spots remain from the previous test etches. Once they are gone, it's back into the ferric chloride. And here is the blade out of the etch. 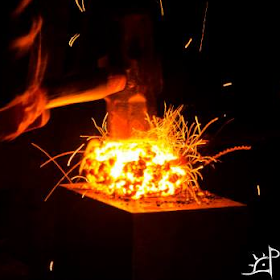 Not many people outside the bladesmithing community realize that the etch will eventually darken all the steels (unless you are working with stainless which is a whole other animal all to itself) and the non tactile pattern is brought out by lightly sanding the blade to brighten the high spots while the dark remain untouched. 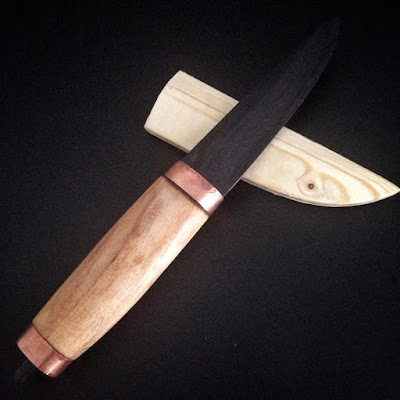 Midway through the finishing, I thought of something which would set my puukko apart from the others. I have never seen this done before, so I went for it and later came to like it rather much. Instead of having a uniform finish, I started sanding the spine bevels to remove every trace of the etch. It sort of gives an illusion that the spine is the edge, but I like the contrast in the crispness of the bevel's spine. Sanded the rest of the way to a nice bright mirror, the blade went straight into a protective wrap of paper towel and cellophane. Then, the handle went on for the last time. Although the tang will be peened to lock the components in place, I also added a little epoxy to the tang for rust protection and reinforcement. I should also mention that at this point, the handle was far from striking. The grain was bland and variation all but absent. So I lit it on fire. 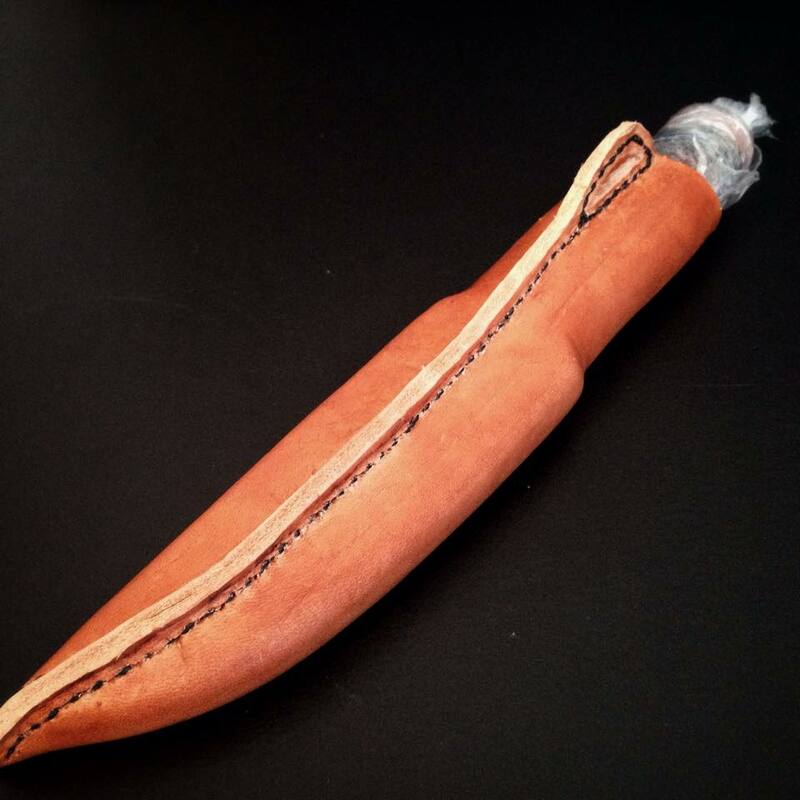 While that cures, it was back onto the sheath. 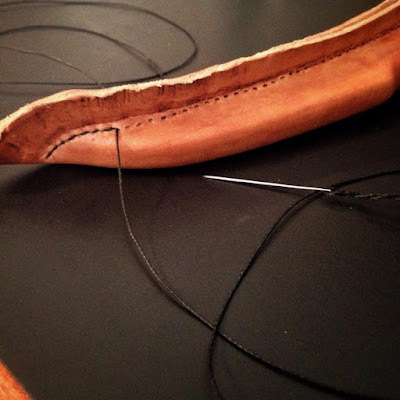 Despite having plenty of good leather to work with, I instead used this scrap from something or other that was of extremely poor quality and would probably have been thrown out. While the face is alright, the backside was porous and fleshy, and overall it was very thick. 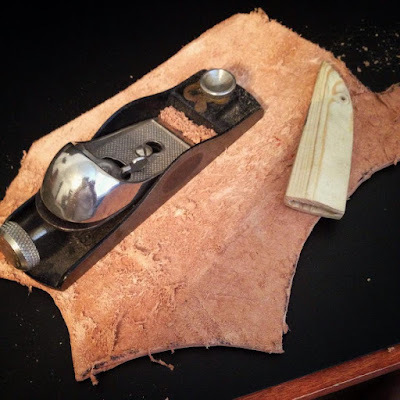 Trying out something that came to me when I heard a suggestion of using a spoke shave to chamfer edges for stitching, I sharpened the block plane and began to have at it. At first, it was a mess, and the only result was fine dust everywhere. Then the magic happened. Nice, even shavings curled out of the throat and a pristine surface was left behind. 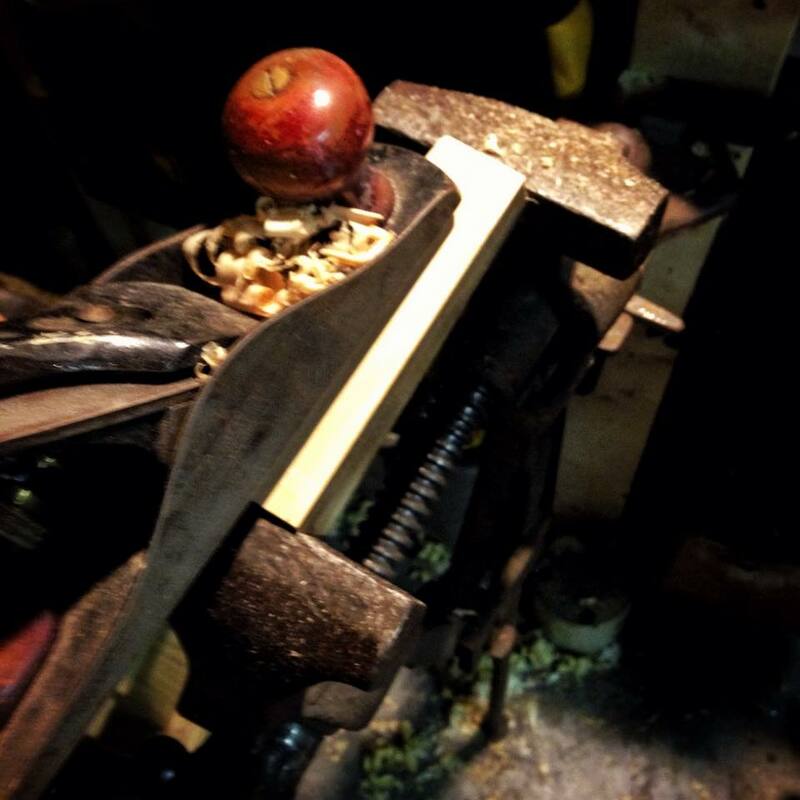 Over the entire surface I worked the block plane until it was a uniform thickness and all the knots and strings were gone. Who would have thought? Handle dry and tang peened, I wrapped the lot in more cellophane, dampened the leather for wet forming, and dive right in. Wet forming leather is not overly difficult but at the same time extremely satisfying when it comes out right. Burnishing the contours into place and pulling it just so, I was able to bring it to fit just like a sheath should. At first, I was tempted to punch the holes for the stitching before forming it or before it was completely dry due to the strange shape, but I am glad I did not. With my trusty sharpened nail, I hammered through after marking it with a star wheel, aiming a little low of the corner so I could pull the leather tight around the wooden core. I was also tempted to cut the leather before I did, but once again I am glad I did not. It is infinitely easier to cut large and work down to size than measure a thousand times and still have to try and get more out of what you have when it is inevitably too small. With the spoke shave, I trimmed down the spine of the seam until it stood about 3/8 of an inch proud. At the top, I left in a little eye for lanyard for fastening it to a belt or whatnot. 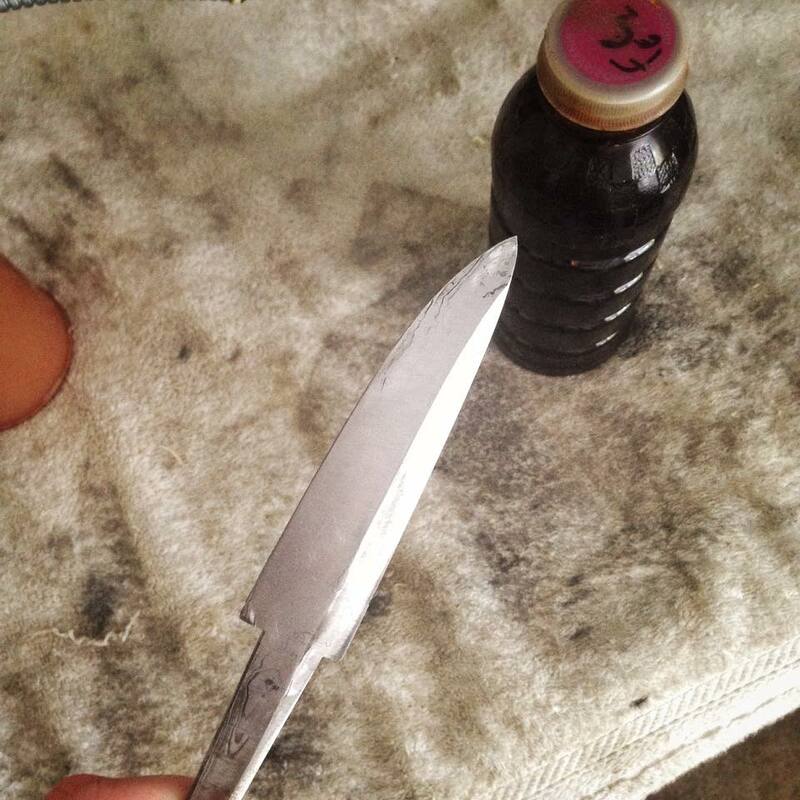 At this point, all that remains is to seal the leather and unwrap the knife for its final oil and photographs. I must have forgotten to take a picture during the sealing, but I used a home made recipe that I came up with when I made an armguard a while back. This has done a fantastic job at protecting from moisture, and all but waterproofs the leather. If I were to do it again, I would add more oil so it is easier to apply at room temperature. Because of the wax, I had to heat it all back to a liquid for this, and submerged the leather entirely into the jar. Invariably there will be too much on the surface if you do it this way, but it is easy to buff off, and the surface penetration is much better when the leather is submerged into the hot bath where it can absorb the mixture. That's it! Throughout the process I learned a great deal and developed a deal more in the realm of hand tool technique. What is perhaps the most important, I forced myself to believe that the only limitation on our work is that which we set in our mind. Neither more space nor the newest, greatest tools and materials will make you any more able. Faster, perhaps, but no more skilled and certainly no more able to get out there and create.